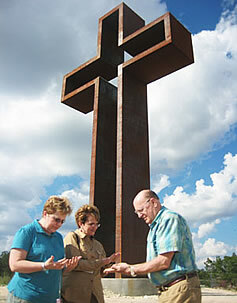 Thousands of people have already been touched by God through "The Empty Cross" in Kerrville, TX.This unique Cor-ten steel sculpture stands 77'7" tall, on a 1930’, hill over IH-10. The symbolic Resurrection cross is the focal point of the Kerrville Garden. People are being saved, empowered, baptized, delivered and healed, even though the 23 acre spiritual Garden is not finished yet! Documented miracles are happening daily at the cross. People have even been transformed by simply visiting the TCKF websites!